Kelvin Mulembe took his oath of citizenship Wednesday, and found it felt like affirmation. 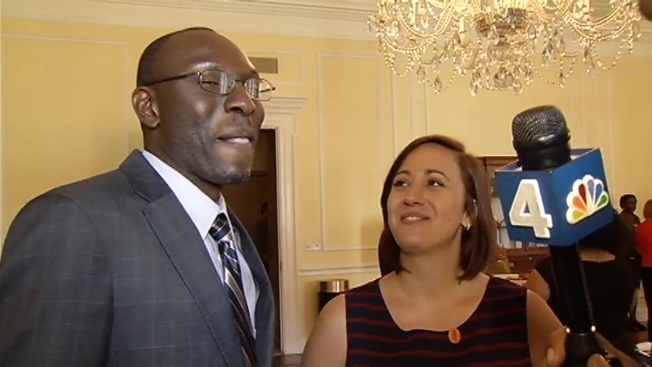 "It's affirmation that I have gifts and talents that I can contribute to the development of this community that I am joining," said Mulembe, who took the oath in Washington, D.C. surrounded by the historical documents of the National Archives. "It's also just confirmation to me that I am accepted." Thirty-six people were sworn in Wednesday in the Archives' Rotunda, which is home to the original Declaration of Independence, Constitution of the United States and Bill of Rights. The ceremony was one of more than two dozen nationwide held on Constitution Day, which celebrates the day in 1787 that the Constitutional Convention met for the last time to sign what would become the U.S. Constitution. This year is the 227th anniversary. While welcoming new Americans into the country, the organizers of this year's Constitution Day are also trying to help Americans already here understand the Constitution and the government it formalized. In a new survey, only a little more than a third of those asked could name all three branches of the U.S. government; 35 percent could not name a single one. And only 27 percent of those surveyed knew a a two-thirds vote of the House and Senate was required to override a presidential veto, according to the survey by the Annenberg Public Policy Center at the University of Pennsylvania. In response to the lack of civics understanding, a group of non-partisan organizations came together Wednesday to launch the Civics Renewal Network, "to raise the visibility of civics education and to make high-quality resources more accessible to teachers," according to the Network's website. And schools tried to make it fun. More than 550 schools across the country joined the effort by reciting the Constitution's Preamble. That included 50 students who gathered at the Capitol from across the country, chosen because they had developed civics projects that helped their home communities. Many of the festivities -- and the feelings behind them -- were shared on Twitter using the hashtag #ConstitutionDay2014. "This is the fun part of being a judge," said U.S. District Judge Emmet Sullivan, who presided over Mulembe's ceremony. "No one loses, there's no litigation. ... We're all winners. America wins because we have new Americans, and the new Americans win because they have a new home."